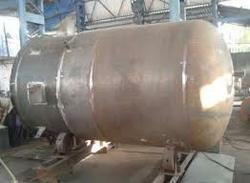 With the help of our expert team members, we have been able to offer a wide range of Fabricated Storage Tanks. These are engineered using top quality components and following international industrial standard. Our tanks are acclaimed for their sturdiness, robustness and high functional life. We offer these devices at market leading rates. Incorporated in the year 1981, in Anand (Gujarat, India), we “Machining Corporation” are a leading Manufacturer and Supplier of a superior quality range of Pressure Vessel, Heat Exchanger, Reaction Vessel and Fabricated Process Equipment. We have a well-established infrastructural unit that is furnished with latest tools and machinery. To ensure systematic work flow, this infrastructure is divided into several functional departments like procurement, manufacturing, quality-testing, warehousing, packaging, etc. This ultra-modern infrastructural unit helps us in manufacturing the range as per the demands of our clients. In order to meet the exact demands of our valuable customer, we provide this range in a number of specifications as per their needs.